What can be prettier than snowdrops in the depths of winter? Are there any bulbs more charming than proper English snowdrops? Except that they are not English at all, having been introduced from Europe where they have a wide distribution. I had thought they were called ‘snowdrops’ because they often peek through snow (a light covering, I assume because they only grow about 15 to 20cm high) to herald the coming of spring, but I see the botanical name translates from Greek as milk flower. Because we lack the chilly temperatures and snow here, we are limited in the range of galanthus that we can grow well. There is such a word as a “galanthophile” – one who is obsessed with the genus but you would have a hard job earning that epithet here in the mid north. Easily the best performing snowdrop for us is Galanthus S. Arnott which never fails to delight and increases satisfyingly well. We keep gently increasing its spread around the garden and that also staggers the flowering because it will come in later in colder parts. You don’t get a long flowering season but oh they are so very charming. The proper snowdrop has a little inner trumpet of three petals surrounded by a skirt of three outer petals which look like little wings. Sometimes people refer to the stronger growing snowflake, often seen in paddocks, as a snowdrop. But it is not. It only has the inner trumpet of petals and lacks the delicate charm. It is also a different genus, being a leucojum. This entry was posted in Plant collector and tagged Abbie Jury, Galanthus S. Arnott, snowdrops, Taranaki gardens, Tikorangi: The Jury garden on 12 July 2013 by Abbie Jury. It’s snowdrop time. Proper snowdrops which are galanthus. These are widely referred to as English snowdrops, though they are not. In fact they occur naturally throughout Europe and down through the Mediterranean. It is just that the English have made them their own and who can blame them? Snowdrops rank right up there beside daffodils for that feeling of seasonal wonder. We lack the snow of course, so we don’t get the simple picture of the flowers appearing through melting snow. I assume this is why they are called snowdrops in common parlance. We will never be galanthophiles here, though that has more to do with climate than anything else. We have a number of different types of snowdrops but most are very marginal in our mild conditions and we struggle to keep them going here so there is no point whatever in collecting as many different ones as we can and keeping them separate, as galanthophiles will. While there are only about twenty species, there are hundreds of named varieties. Most of these are species selections. 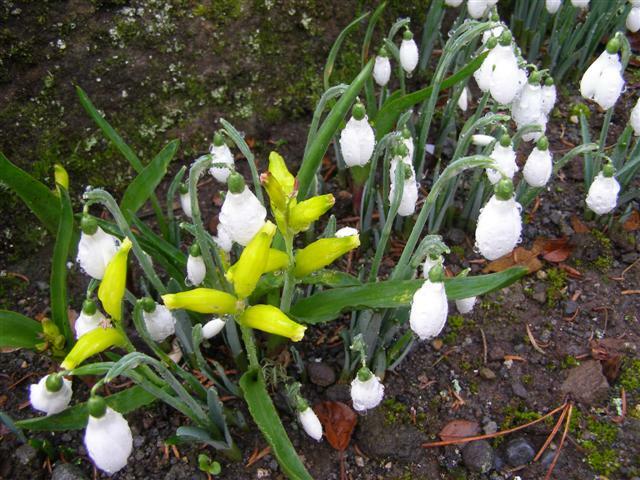 In other words, while snowdrops will seed down in the wild, particular variations have been selected out and then propagated from that original bulb (as opposed to raised from seed which won’t keep the variation stable – most will revert immediately to the usual form). We could only look in awe at the fabulous prices paid for a very good new white and yellow snowdrop in the UK last year. It was knocking on the door of past times when the wealthy paid vast amounts for a new tulip bulb. While we have the old double variety, G. nivalis Flore Pleno, we have not sought the many variants on doubles. Flore Pleno is not flowering yet so I can’t photograph it but it looks a bit of a mutant and lacks the charm of the simpler, more natural forms in my eyes. In this country, if you want to see snowdrops in all their glory, the place to go to is Maple Glen where Muriel Davison has built up extensive plantings in her large garden. Unfortunately for northerners, it is sited at Wyndham between Gore and Invercargill so few of us are likely to make it at the right time. Or time a late winter trip to the UK. For years I had a photo a reader sent me of a carpet of snowdrops (and we are talking bulbs in the magnitude of five to six figures all in bloom at the same time) beneath white barked birches somewhere in England. So I know that our snowdrop efforts here are modest by those standards. But we have snowdrops, and quite a few of them now. The one variety that performs consistently well in our conditions, flowering reliably every year and building up readily, is Galanthus S. Arnott. Apparently it is equally good in the UK because it has been given an Award of Garden Merit from the Royal Horticultural Society. The peak flowering season is not a long one. It is just enchanting while it lasts and snowdrops lend themselves to drifts in garden borders, on woodland margins, in our growing bulb hillside (coming through the grass) as well as being featured in rockery pockets. They flower at a time when there is not a lot else out. While typically regarded as harbingers of spring, they are more mid winter. We keep gently spreading them further afield in the garden. Many British gardens open in February for what is often called a snowdrop weekend. That is the aim here. It may take us another decade to get sufficient carpets of snowdrops to warrant declaring snowdrop weekend, but we could never be accused of taking the short term view of gardening. And we are well on the way. Curiously with snowdrops, the practice is to lift, divide and replant soon after flowering. There aren’t many bulbs where you are advised to move them in full growth. In England they are often sold as “green bundles” when still in growth. I have taken from this that they are not fussy so I move them any time now – whether dormant or at any stage of growth. Typical of all bulbs, they need good drainage and reasonable light levels. Woodlands overseas are largely deciduous which means they have more light. Our dominance of evergreens in this country leans us more towards forest than woodland. That is why we go for planting the margins rather than the depths. Finally, just for clarification, what is often referred to as a snowdrop in New Zealand is an entirely different family. The leucojum is much stronger growing, often found in old homestead paddocks, associating with daffodils. It has the little cup without the surrounding skirt of petals and is less refined than a proper snowdrop. Notwithstanding that, it is an under-rated garden plant with a very long flowering season. But it is a snowflake not a snowdrop. This entry was posted in Abbie's column and tagged Galanthus S. Arnott, gardening, snowdrops, Taranaki gardens, Tikorangi: The Jury garden, winter bulbs on 29 June 2012 by Abbie Jury. I have this little self-imposed rule which is that I can’t repeat a plant (at least, not yet) so the plant this week is not the delightful English snowdrops (this form is Galanthus S. Arnott which is the most reliable performer in our conditions), even though the clumps and drifts we have in full flower throughout the garden are an absolute delight. No, we are looking at the yellow flowers coming through with the snowdrops. This is Lachenalia reflexa. It is the yellowest of the lachenalias we grow here, all of which are native to South Africa. There are well over 100 different species, often taken for granted in their homeland where they are just wild flowers. Not all are easy to grow. Reflexa isn’t too difficult though it is not particularly vigorous, which is why it is not common. The yellow is a pure bright lemon shade, sometimes with green markings which fade out as the flower matures. Like most lachenalias, it doesn’t hang onto its foliage for particularly long after flowering. These plants are growing on the edge of our gravel driveway beside a low stone wall. Many of the species bulbs (which is as they occur in the wild) are used to surviving in quite harsh conditions with little soil and low fertility. If you try and treat them like choice garden plants, they don’t always cope. The critical issue, as always with bulbs, is to ensure excellent drainage, even more so when they are dormant (in summer for reflexa), to avoid them rotting out. This entry was posted in Plant collector and tagged Galanthus S. Arnott, Lachenalia reflexa, snowdrops on 23 July 2010 by Abbie Jury.